What is your name in Warband, TaleWorlds and on Steam? Did you read and understand the Constitution of the Company Guard of Istiniar and the Charter of the Branch Guard of Istiniar [Native]? How well do you speak or understand English? Do you have a working microphone/headset? I speak English well and I do have a microphone. What are you favourite classes? Through the course of a few years, with large breaks inbetween. Have you been in other clans for Warband (mods included)? If yes, which clans have you been part of and why did you leave them? Why do you want to join the Guard of Istiniar? Organized battles seem like a whole lot of fun. I'd like a change from the monotonous PvP clusters and singleplayer battles. How have you heard of the Guard of Istiniar? I looked for organized battle groups until I found the one I liked the most. 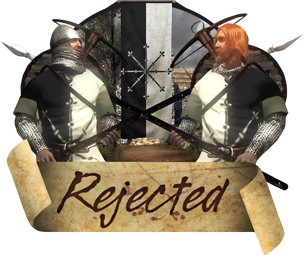 We have closed our Warband branch and stopped accepting new members. You are welcome to apply again in the future if we establish a new branch.